Our well-loved range of flavoured tuna combines the natural goodness of tuna with delicious flavours, add to this the convenience of a tuna pouch that does not require the draining off of liquid, a pouch that contains flavour infused tuna flakes, and you will know that the new tuna pouch is just right for you, a tasty protein hit on the go. 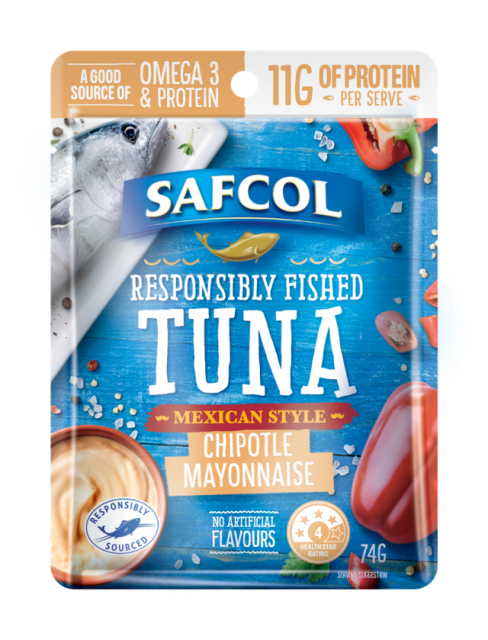 Safe and easy to open with the very finest and freshest tuna, with no artificial colours, flavours or preservatives. Ingredients Skipjack Tuna(Katsuwonus pelamis) (60%), mayonnaise (37.5%) (water, tomato paste, sunflower oil, sugar, vinegar, wheat starch, modified corn starch (1422), whole egg powder, salt, chilli powder, citric acid (330), colour (171), thickener (415), pepper), capsicum (2%), chilli (0.5%).